A manual transmission clutch controls how much power is transmitted from the engine to the wheels by limiting torque. The clutch engages and disengages manual transmissions through friction between the clutch plate, clutch disc and flywheel. The flywheel connects to the engine, and the clutch plate connects to the transmission shaft. When you press the clutch pedal to disengage the clutch, pressure is applied to the middle of a diaphragm spring, pulling the pressure plate away from the clutch disc, disconnecting the clutch from the engine. To engage the clutch, release the clutch pedal, the spring pushes the pressure plate against the clutch disc pressing against the flywheel, connecting the engine to the transmission. 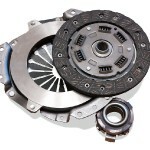 The main reason why clutches fail is due to wear and tear caused by the friction. At our North Attleborough auto repair shop clutch service is affordable and quick. Our mechanics check the hydraulic system, master clutch cylinders and clutch slave cylinders before we start any clutch repair to find the exact problem before replacing the transmission clutch.